Acne is a treatable condition that is often a manifestation of a deeper internal imbalance. In many cases, acne is a result of inadequate detoxification and insufficiency of the liver to process chemicals and hormones. This results in a backlog, and higher than normal levels of hormones left in circulation. These excess hormones, particularly testosterone lead to the production of acne. Women are particularly susceptible to excess testosterone as we use less of it for normal body functioning. This excess testosterone can bind to androgen receptors on the skin, which then gets excreted in the form of acne lesions. Additionally, testosterone can lead to increased sebum production which is our skins natural oil. Acne-causing bacteria, Propionibacterium acnes feed on sebum, so when there is an overproduction it creates a more optimal environment for this bacteria to thrive. Taraxacum officinalis (Dandelion Root) – a great herb for supporting liver detoxification and facilitating the elimination and clearance of excess toxins. This herb has laxative effects that also help to clear waste products and toxins from the digestive tract, so use with caution. Can use as a tincture or steeped into a tea. This is also a common tea that you can find in the health food section of your grocery store. Berberis aquafolium (Oregon Grape) – indicated for skin conditions that are related to poor clearance of hormones by the liver. This herb is also an antimicrobial when taken internally, which may help is intestinal dysbiosis is part of the picture. Can use as a tincture or tea. Galium aparine (Cleavers) – stimulates the lymphatic system which helps detoxify, excrete excess hormones and supports the immune system. Can be used as a tincture or tea. Urtica dioica (Stinging Nettle) – assists in detoxification, especially of the kidneys as it is also a diuretic, which helps flush out toxins through the use of the urinary tract. Glycyrrhiza glabra (Licorice Root) – an anti-inflammatory herb that can assist with the inflammation of cystic acne and support liver clearance. Camellia sinensis (Green Tea) – provides antioxidants in the form of ECGC which slows the conversion of testosterone to DHT, therefore decreasing the amount of androgens that bind to skin receptors and cause sebum production. Green tea is also anti-inflammatory, so can decrease internal inflammation when consumed as a tea, as well as acne lesion inflammation if used topically. Green tea can easily be found at any grocery store, Matcha has even higher antioxidant and therapeutic properties so if possible, Matcha is best. Mentha spicata (Spearmint) – spearmint is anti-androgenic, and therefore reduces the levels of circulating testosterone and DHT, resulting in decreased sebum production and less opportunity for P. acnes to invade and cause acne. Herbal tea is a great therapy to add into a skincare protocol because is it cheap, effective and provides the skin benefits of hydration. When our skin has adequate hydration, the moisture barrier is stronger and helps defend against invading microbes that can lead to inflammation, impaired digestion, sluggish detoxification and ultimately acne lesions. 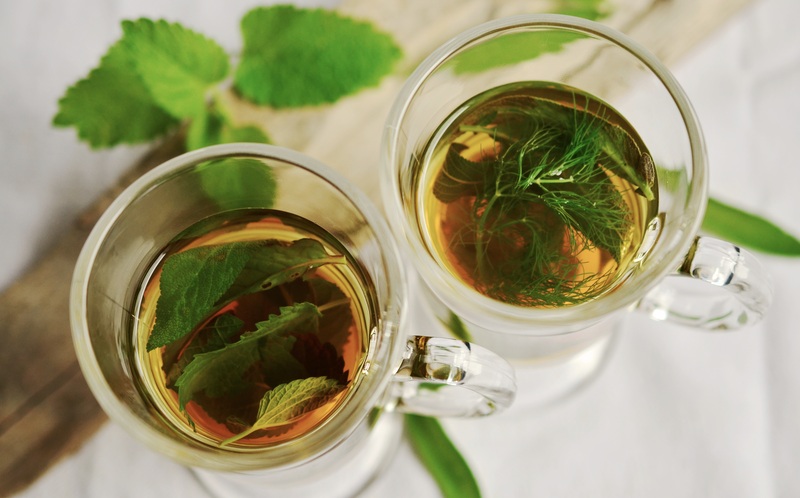 For most people, herbal teas are not a therapy that can be used alone to treat acne and are often part of a more extensive treatment plan. For individualized assessments and natural protocols for your skin, book an appointment with your Naturopathic Doctor.